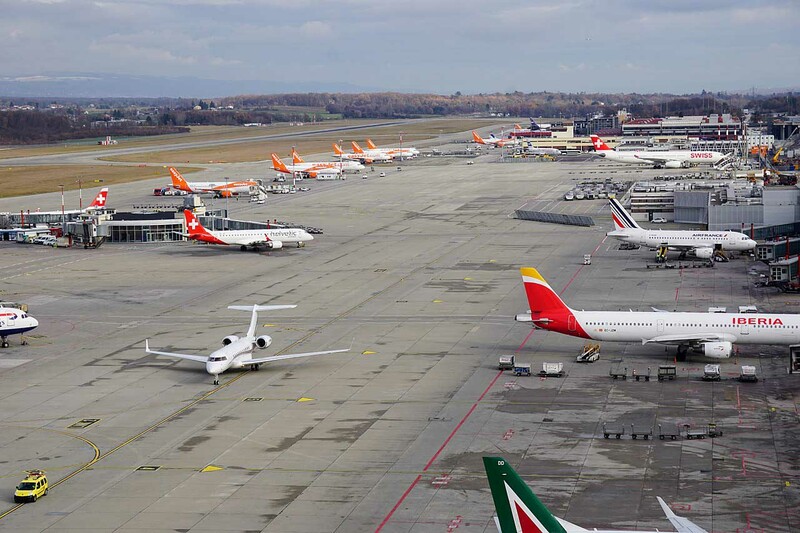 Geneva Airport is an important international airport serving the Swiss city, from which it is just over 4 km. With over 15 million passengers in the 2014, it is the second busiest airport in the country, after Zurich. It has 2 Terminal: T1 and T2. The latter is the old Terminal, currently used for charter flights and seasonal connections. The most recent T1, on the other hand, is used for most flights. Inside, you will find all the essential services, numerous shopping areas, bars, restaurants, duty-free shops, pharmacy, lounge area. For the little ones, play area and equipped area. You will also find a meditation room and a designated smoking area. Here is a list of the main companies and direct connections * with Geneva Airport. Aegean Airlines: Athens. season: Crete-Heraklion, Rhodes. British Airways: London-City, London-Heathrow. Seasonal: Edinburgh, London-Gatwick. EasyJet: Alicante, Hamburg, Amsterdam, Barcelona, ​​Berlin-Schönefeld, Belgrade, Birmingham, Bordeaux, Brindisi, Bristol, Brussels, Budapest, Catania, Copenhagen, Krakow, Edinburgh, Funchal, Lille, Lisbon, Liverpool, London-Gatwick, London-Luton, Madrid, Málaga, Manchester, Monaco, Naples, Newcastle upon Tyne, Nice, Palermo, Palma de Mallorca, Paris-Orly, Porto, Pristina, Rennes, Rome-Fiumicino, Santiago de Compostela, Seville, Stockholm-Arlanda, Tel Aviv-Ben Gurion, Tenerife-South, Toulouse, Warsaw-Chopin, Venice, Vienna. Seasonal: Aberdeen, Ajaccio, Alghero, Athens, Bastia, Belfast-International, Bilbao, Bournemouth, Cagliari, Calvi, Dubrovnik, Faro, Figari, Fuerteventura, Glasgow, Gran Canaria, Heraklion, Hurghada, Ibiza, La Rochelle, London-Southend, London- Stansted, Malta, Menorca, Mykonos, Olbia, Pisa, Pula, Reykjavík-Keflavík, Santorini, Southampton, Split. Flybe, seasonal: Birmingham, Cardiff, Doncaster Sheffield, Edinburgh, Exeter, Isle of Man, Jersey, Manchester, Southampton. Jet2.com, seasonal: Birmingham, East Midlands, Edinburgh, Glasgow, Leeds / Bradford, London-Stansted, Manchester. Norwegian Air Shuttle: Oslo-Gardermoen. Seasonal: Copenhagen, Stockholm-Arlanda. Pegasus Airlines: Antalya, Istanbul-Sabiha Gökçen. Small Planet Airlines, seasonal: Vilnius. Swiss International Air Lines: Athens, Barcelona, ​​Dublin, Florence, Lisbon, London-City, London-Heathrow, Madrid, Málaga, Marrakech, Moscow-Domodedovo, New York-JFK, Nice, Palma de Mallorca, Port, Prague, Pristina, Valencia, Zurich. Seasonal: Ajaccio, Alicante, Biarritz, Brindisi, Catania, Corfu, Faro, Heraklion, Hurghada, Ibiza, Kalamata, Larnaca, London-Gatwick, Mykonos, Olbia, Pula, Thessaloniki, Zakynthos. TAP Air Portugal: Lisbon, Porto. Thomas Cook Airlines, seasonal: Manchester. TUI Airways, seasonal: Birmingham, Bristol, Edinburgh, Glasgow, London-Gatwick, Manchester, Newcastle upon Tyne. Vueling: Barcelona, ​​Rome-Fiumicino. Seasonal: Gran Canaria. From this link, you can buy your flight to Geneva Airport AT THE LOWEST PRICE! Modern and efficient, with an almost perfect organization. Add us also ... free transport. This is Geneva Airport. This is Switzerland! As soon as you land, check-out, you can pick up your own free ticket at the distributors located in the baggage area of ​​the arrivals hall. The train station is connected to the check-in area and the arrivals hall. Every 12 minutes there are links with Geneva-Cornavin, in the center. The service is active every day, from Monday to Sunday, from 04: 50 to 01: 30. The journey takes around 7 minutes. Alternatively, there are well 9 bus lines that allow you to reach many areas of the city. The free ticket available at Geneva airport can be used on trains and buses, with a validity of 80 '. From the 2018, Geneva Airport and the tpg transport company have established the Aérobus service. Six bus lines (from A1 to A6) completely free, destined for passengers of the Geneva airport, to move after midnight, up to 06: 00 in the morning. From the Genève-Aéroport train station you can reach many Swiss destinations, with the IC, IR, RE trains. The links are guaranteed by the Swiss SBB / CFF. Lausanne, for example, can be reached in approximately 50 'by train, with prices starting from 13.50 CHF. For Vevey, on the other hand, it takes about 80 'of train, with prices starting from 80'.